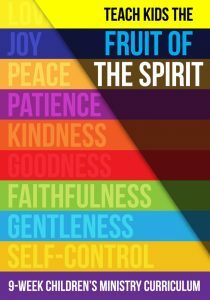 Fruit of the Spirit is a 9-Week Children’s Ministry curriculum that is all about teaching kids that by trusting in God and filling our mind and heart with God’s Word, the fruit of the Spirit will start to naturally be seen in our life. The Bible says that “God is love.” When we live by His Spirit, we will be like Jesus and do things out of love for others instead just doing things for ourselves. True, lasting joy can only come from knowing we have eternal life by believing in Jesus and accepting him as our Lord and Savior. Peace isn’t just about feeling calm; we need to be peacemakers, helping people find peace in the midst of conflict. Sometimes we want things done on our schedule, but we need to be patient and realize it’s ok for others to go first and realize that sometimes waiting is part of God’s plan. God is filled with loving kindness, and when we are filled up with God, we will show kindness to others whether or not they deserve it. Any goodness we have comes from God. We need to remember that we are naturally sinful, but that we can do good things when we choose to live God’s way. When we commit to doing something and don’t quit until it’s done, we are showing faithfulness. When we always choose to make the right choice, even when tempted to do wrong, we are showing faithfulness. With help from the Holy Spirit, we can be faithful to God. Gentleness may sound weak, but it actually takes more strength to be gentle. Displaying gentleness to others means that we are considerate of other people and treat them with love and respect even if they don’t treat us the same way. Jesus is our perfect example of gentleness that is also strong and bold. Self-control means exactly what it sounds like, controlling one’s self. It means we are able to tell ourselves and others no when we may be tempted to do wrong. While the other young men in the king’s court indulged in whatever they liked, Daniel and his friends exhibited self-control and they were blessed because of it. 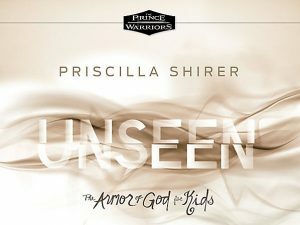 UNSEEN: The Armor of God for Kids is a seven-week Bible study designed to help leaders teach kids what the Armor of God is and to help them discover how they can apply the armor in their lives. During the seven weeks, kids will learn that Satan is real and that he stirs up trouble all around them. They will learn how each of the pieces of armor can help them be on guard against the enemy. Kids wills discover ways to employ the Belt of Truth, the Breastplate of Righteousness, Shoes of Peace, the Shield of Faith, the Helmet of Salvation, and the Sword of the Spirit in their own lives.